You have so many friends. So tell them to add your link on their little blog. They might not blog professionally. But they can give a link. The link value will be not worth much, But remember it’s worth. 2. Sharing homepage links(noFollow) with other bloggers in your niche. You can be friends with other bloggers in your niche. They are your competitors, But without their links you can’t do this. Because the word ‘Relevant’ is in their hands. But if you exchange links on Blogroll or in Sidebar of their blogs, You need to use NoFollow attribute, as Google punish those who don’t. You can exchange links using this way. You give a link for him and he gives a link to you. 4. Sharing post page links with other bloggers in your niche. This one is the best method of link exchanging. Because it don’t put you in a Risk!. Google also likes these type of links, as they are relevant. You need to ask for your niche bloggers to exchange links on their posts. You link them to using their Keyphrases and they link to you using your KeyPhrases. Nice ahh.! 5. Write Professional content regularly. Yeah I mean regularly. Manage to do post regularly. It might be hard at some instances, but you need to do it. Always write only Killer, Long article which are full of information. They will eat the competition! 6. Use PPC and see the results. You can use PPC in a profitable manner. Some visitors come from those ads will share your content. You can’t guarantee that. But if your content runs like a king in the mind of readers, surely you will have some shares from them. 7. Write articles for article directories like EzineArticle, Articlebase. You can write some articles to article directories. Usually they all have great rankings and Authority. So the links from them will manage to flow more ranking juice which are more valuable. Try to write killer professional 30 articles and then submit them to highest ranking article directories. You’ll feel the increase of Visitors after a month. 8. Submit your feed to Syndication sites. There are many sites that Syndicate content. Try to participate in them. I mean try to add your blog also to that Syndication list. You’ll have some readers also from those sites. Syndic8 is one of them. 9. Write articles on other blogs in your niche usually called Guest Posting. This one is the best method I recommend. Find some well-established blogs in your niche and write some cracking Guest Posts. Those posts also bring you lot of visitors while giving some relevant links. So this is the game. Write 50 Guest posts now and select 50 blogs and distribute them within a week of time frame. You’ll have cracking party in your blog. I sure you’ll have that party. 10. Email your best content to bloggers in your niche. Yeah, this is looking little spammy. But spammy is your behavior not your work. If you managed to write Killer Professional Articles, then you can recommend them to bloggers in your niche. Write an email saying only that you believe the blogger likes your article. And put a link to it. No need to say stories in your mail. You’re dealing with bloggers. So you need to care about their valuable time. Then if your article won the mind of that blogger. Then surely they will recommend it to their readers also. That gives you a link. This is the first and most wanted Directory you need to submit your blog. This is ODP Directory or Open Directory Project runs totally by humans. All the submissions are manually checked by someone. So this directory offers the most valuable links. Authority of your blog also rise. Google and other Search Engines are using these information on DMOZ. 12. Submit your blog to other Quality blog directories both paid and Free. There are so many other useful blog directories. Firstly make a list of Quality High Ranked Free blog directory list and submit only to them. Then if you like try the paid directories. When you submit to blog directories always care about the directory. It might send bot traffic or other spammy thing and will lead your blog to penalized by Search Engines. Google don’t like low quality bot directories. So try the most popular directories only. 13. Submit your blog to RSS directories. This one also like blog directories but gives more links than those blog directories. So you must try this also. Make sure you review the quality of the RSS Directory before submitting. 14. Tag your blog in Delicious. Share your blog in Delicious. It will give you more exposure. 15. Share your content in FaceBook, Twitter. You can get some visitors from these two Social Networking sites. And some links too. 16. Pin your interesting content in Pinterest. This one is the new Social bookmarking sites. It’s a cracking rocket. Many people got huge traffic from this site. It’s a god. Pin your bests in interesting Pinterest. 17. Share your content in Digg. This one is also another Social Bookmarking sites but with higher rankings. Add your best there too. 18. Tell your friends to vote for your Digg, Delicious links. Try to bring your link onto homepage or features list in those social bookmarking sites. Then you’ll have great rankings and much traffic. That traffic also helps you to get more shares on those sites. You have other bloggers in your niche. Recommend their posts to your readers. Then that blogger will be notified your link to his post and will be appeared in his post under Trackbacks section. You get a link nicely. Do this honestly. 20. Answer some questions on your niche on Yahoo Answers. Another cracking place to grab more links and traffic. You can answer relevant questions and add your link to resource box. This will bring traffic to some extend. Try to answer 10 questions every week. Before you can post click able links you need to be in Level 2. This one is a classified ad service. Post about your blog in there too. 22. Use Google Groups to distribute your content. Create a group in there and get some members. Distribute your content. Get links! 23. Try to create a Wikipedia page for you or for your blog after became popular enough. Don’t do this one If you’re still not well-established blog. And Wikipedia don’t let you create pages as you want them. You must offer some value to its readers. So do it only if you have something special. 24. Use Squidoo Lenses to write Top category posts and link back to your blog. Write nice articles and put a link back to your blog. 25. Provide your RSS feed links as some small bloggers use that Feed. Place RSS feed links on your blog. Small bloggers or spammy bloggers use these to make their blogs automated. So you’ll get a link since it’s RSS feed post. 26. Use your blog links in the Signature field of Forums. Use relevant niche Forums and be active on them. Write some introduction paragraph, add some most valuable facts not all of them. Then do a link back to your blog. Do this honestly and at the correct time. Don’t go to do this once after you register there. First be active and show you’re real. Then second is that thing. 27. Post your blog links in the Personal Profile of sites If they allow. There are so many membership sites. Most of them allows you to add your blog link to profile page. So add which allows it. FaceBook, Twitter are two examples, But there are non-Social Bookmarking sites too. 28. Write Reviews in Alexa for related blogs. Write a clear honest review for related blogs in your niche. This will add exposure to your blog. Sometimes a link back. 29. Buy newly launched Digital products and write Testimonials for those with your link. There are so many products and services released on Internet every day. So try some of them and Ask to write a Testimonial with adding a link back to your blog. Don’t care about the money. Try it. Because if the product is Real and satisfying its customers it will rise up and become popular. So the links are valuable. 30. Write professional useful comments. You may already have a list of relevant blogs in your niche. 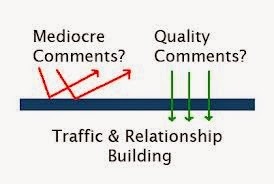 So read their posts and write a Quality Important Valuable Comment. All the big attracting comments get some traffic and exposure while giving a relevant link. This one also used by me widely. Think different and unique way, and Hold a cracking contest. It’ll help you to get large number of links depending on your contest. Try to design one that gives optimum results. 32. Design some nice tools to do works easily. You may be blogging about Blogger Tricks and then you can design some web-based applications or funky tools. For example design a tool to check how many links in a page. There are so many tools like that. So think different. 33. Create some nice looking WP and blogger templates and submit them to template sites. This one is a good way only if all the bloggers who are going to use these themes or templates are going to be popular. But unfortunately even half of them not going to be success. Anyway you can get links from the footer credits every time when someone use your themes or templates. 34. Try designing a Chrome extension or Firefox Addon. The best face to face fighting browsers in the world are Firfox and Chrome. So create some useful addons and extensions for them. No matter what it makes easier for the user. Just make a good important one. It not need to be or relevant to your niche. After creating add a page on your blog about that one. People will link to it because it’s the addon/extension homepage. As I said earlier Killer articles won the game mostly. These are going to be viral sometimes. 36. Write cracking tutorials with every single point included. This one also linkbait post – Posts which are really writing with the aim of getting trillions of links. Really great tutorials are going to get links easily. Because it is really helpful in any corner. 37. Write list posts like this. Another type of linkbait posts. List posts are normally points or facts about a topic. It may be a list of achieving something or it may be a list of myths and so on. If you are using your mother language forums. Then write your blog posts summary or half of the post in your mother language and post in those forums. Try this method if you love to have country traffic. This method is really effective in normal forums. 39. Write an Ebook or a report and submit them to Ebook sites and directories. There are bunch of Ebook sites. So create a free report or ebook and submit them to those sites with a linkback. You can grab traffic also. Free-Ebooks is a good one to start. 40. Create a presentation and submit it to Slideshare. If you have something to say which is complex and needs much words to explain. Then try creating a presentation. submit it to sites like SlideShare. 41. Create a free WP plugin which is really useful and Submit it to WP plugins.